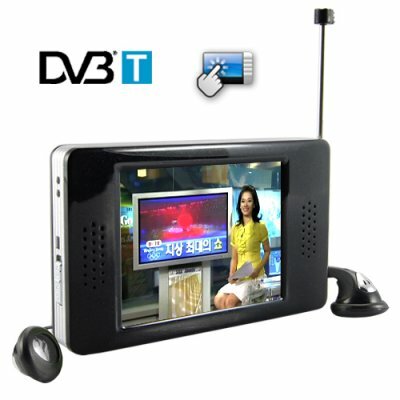 Successfully Added The World's Smartest Portable DVB-T Digital TV (2.8 Inch) to your Shopping Cart. The World's Smartest Portable DVB-T Digital TV has the strongest, most sensitive signal receiver of any device its size, so you can watch crystal clear digital TV everywhere. Work. Meetings. Classes. Girlfriends. These are all things that distract us from what we really want: TV. With the most powerful, most sensitive signal receiver of any device in its weight class, the World's Smartest Portable DVB-T Digital TV lets you receive beautiful, crystal-clear DVB-T digital TV signals anywhere you go: on the bus, in the car, at the beach, and yes, indoors at work, in meetings, in class, at the in-laws house, and in the bathroom. This TV won't lose its signal even when you walk around, change rooms, take the stairs, or flush the toilet. If you've been looking for a way to stay up to date on your favorite news, sports, or entertainment programs, this is it! With a highly responsive touch screen and easy to navigate menus, the World's Smartest Portable DVB-T Digital TV is extremely fun and user friendly. This TV has presets for receiving signals in 23 countries and a pair of extra long, extra loud earphones to make sure you can see and hear the TV clearly everywhere you go. The World's Smartest Portable DVB-T Digital TV is in stock now and ready to ship directly to your or your customer's door. Buy one today for yourself and start enjoying TV everywhere you go. Even better, take advantage of our factory-direct price to outsell your competitors on eBay and Amazon. From your best source of the latest high-tech gadgets, Chinavasion. What makes this DVB-T TV the "World's Smartest"? This DVB-T TV has an extraordinarily powerful signal sensor, allowing it to receive channels clearly, even indoors! No. The touch screen interface is highly responsive and accurate, and the menu buttons are big. Plus, real men don't use a stylus. Will this digital TV work in the U.S.? No. The United States uses a digital TV standard called ATSC, a DVB-T digital TV will not work in North America (Canada, Mexico, U.S.). Can I use this TV to watch analog TV? No. This TV only supports DVB-T.
Won't the "Menu" button and navigation buttons take up space on the screen while I'm watching TV? No. The TV displays in full screen mode. All you have to do is tap the screen one time, and the Menu, Channel, and Volume buttons pop up. When you're finished, the buttons automatically hide after 3 seconds of inactivity, bringing you back to full screen TV. Can I search for channels manually? Yes. You can manually enter a channel's bandwidth and start and end frequency. I don't know any DVB-T channels in my area, can this TV find them automatically? Yes. This portable DVB-T digital TV comes pre-configured for receiving signals in 23 countries and can scan for channels automatically. Will I be able to hear this TV over the noise of a loud bus or subway? Yes. This DVB-T TV has 2 built-in speakers as well as an excellent pair of headphones. With the headphones, you will definitely be able to hear the audio clearly, even on a loud bus. How do I charge this TV? You can charge this TV with the included international AC adapter or by plugging it straight into your computer's USB port.